Jones Homes is putting the finishing touches in place at Greenhill Gate in Penwortham. Work is almost complete on a development of 28 new homes in Preston. The housebuilder reports that all homes, bar one, have now been sold. Jones Homes has invested more than £159,000 in infrastructure for Preston as part of its planning agreement for Greenhill Gate. 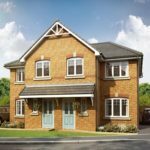 The housebuilder will also be bringing more new homes to Preston and 26 homes are already under construction at Walton Meadows in Walton-le Dale. A further 48 homes are being built at Ribbleswood Chase in Cottam.